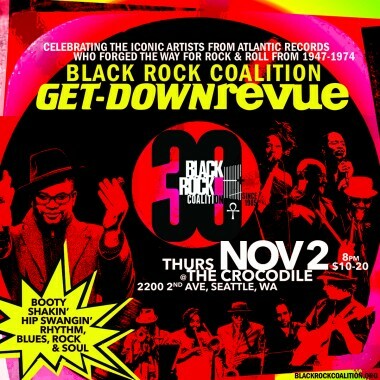 We took our rip-roarin’ Black Rock Coalition Get-Down Revue out west for an encore performance of choice cuts from the Atlantic Records R&B box set. It was a celebration of the pioneers of early rock & roll who called the label home from 1947-1974 and the amazing artists who continue that legacy today. With Luqman Brown (bandleader/vocals), Jared Michael Nickerson (bass), Shelley Nicole (vocals), Ben Tyree (guitar), V. Jeffrey Smith (sax), Lewis ‘Flip’ Barnes (trumpet), Leon Gruenbaum (keys), and Greg Gonzalez (drums).